This clone is our exclusive of a great variant, or mutation, from the population of the proven Blc. 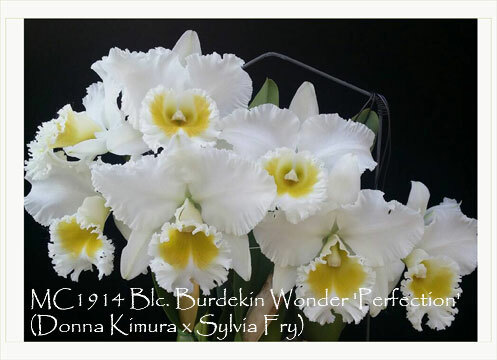 Burdekin Wonder ‘Perfection’ AM/AOS ! A great advantage of this variant is that it has a much more compact growth habit than the original clone, the rhizomes being produced much closer together, not “walking” out of the pot. Another plus is its ability to flower again in the fall. A fragrant and free-bloomer producing up to three massive 6” flowers per inflorescence. With great pest and disease resistance, its flowers are also more resistant to black spots produced by botrytis. Highly Recommended !